I SLEPT FOR 15 HOURS! I woke up and would go down stairs to take advantage of the Onsen that was on the 5th floor of the the ryokan. I would return an hour later to get dressed repack my bag send a few sunrise pix to friends and family, checkout and take the taxi ride to the train station and head back to Tokyo. We would arrive back in Tokyo around 1230 to check into our hotel drop off our heavy bags and head to the currency exchange for more yen! 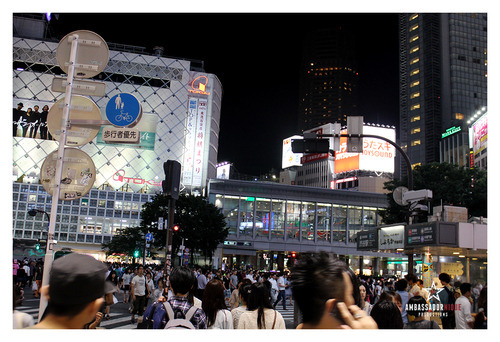 My good friends Sayo and Natsumi would meet us at the Ginza building currency exchange. They would get a chance to briefly meet Dez, Madi and Rupert before Natsumi, Sayo and I would head out for lunch. I wanted Okonomiyaki for a few reasons. It’s very popular, I’ve been asked if I liked it now for YEARS! And a lot of people had asked me if I’d ever tried it. 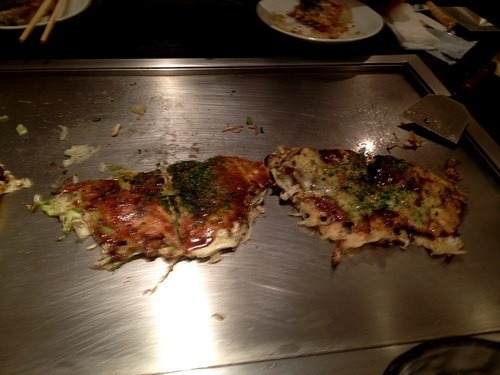 We would go to a spot in Ginza that specialized in okonomiyaki. 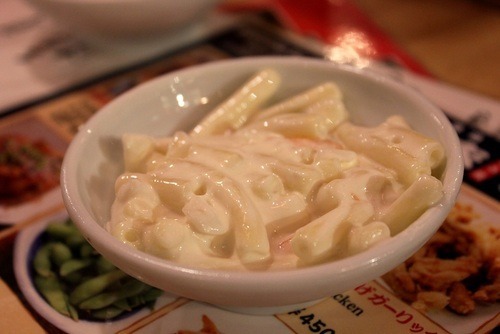 It would be served with grilled ramen, miso soup, Chinese cabbage salad and rice. 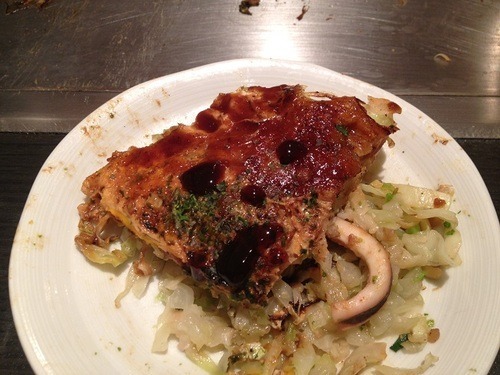 One thing I did not know about Okonomiyaki was that the main ingredient was Chinese cabbage. I am not a fan. I asked if they could make it without it but after the puzzled looked by the waiter I decided just to deal with it and eat it anyway. Honestly, it wasn’t bad! Without cabbage it would have been great lol! Natsumi, Sayo and I talked about our lives, what was going on and what was coming up.Sayo’s husband Nayalan would join us later in the day along with her younger sister Tomo who came all the way from Nagano (2.5 hours via bullet train to spend time with us and see me!). 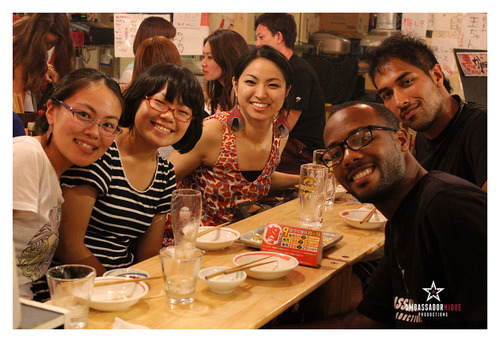 After eating we would head to Tokyo station to meet Sayo’s younger sister, her husband and my friend Yuki. 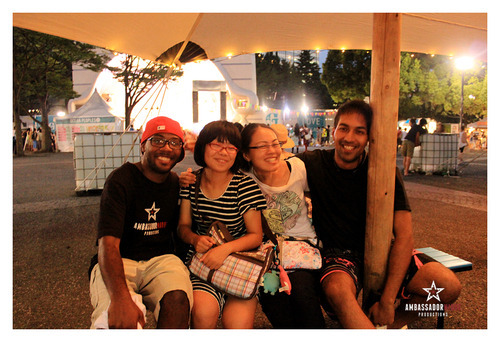 I was happy to see them all, especially to meet Sayo’s husband for the first time whom I had heard so much about. Nayalan is a pretty awesome individual. He pretty much knew Tokyo better than all of us. He would help me find souvenirs for my father, and a Japanese DVD player that I hoped would play my region coded Japanese DVDs (it did.. YES!). I was happy to have a chance to catch up with all of them. Nayalan even answered all of my random questions about his family background. 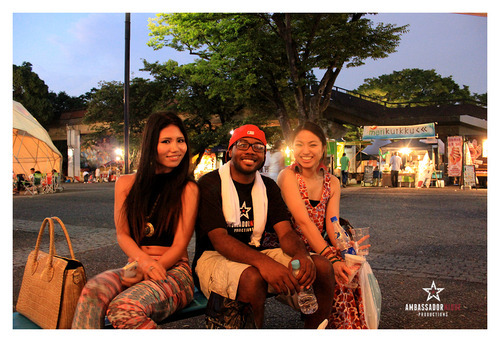 He even has a tumblr and pretty awesome YouTube channel about his life in Japan! He is an artist who draws very well too! 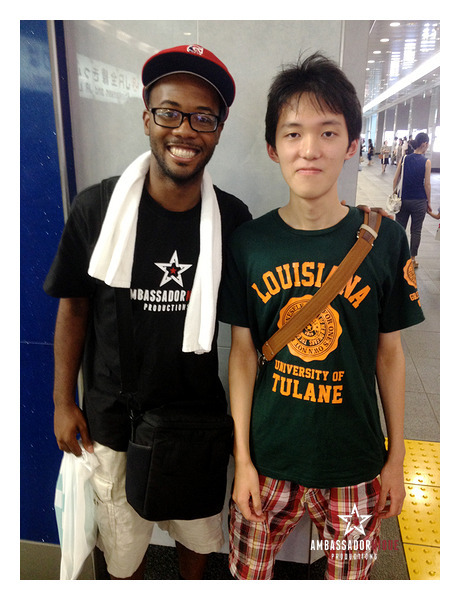 I didn’t get to ask him what brought him to Japan but i know he taught English for 5 years and ended up meeting Sayo. After seein taffy being made and going to the domo store in tokyo station I would randomly see a Japanese guy with a Tulane University Greenwave shirt. I asked if one of my friends could ask him if he would take a picture with me. My brother graduated from undergrad at Tulane in New Orleans, Louisiana, so it was very surprising to see a random person with this shirt. After this the randomness continued when we saw an electric bull outside the station. We all wondered why it was there and Nayalan showed some interest. I told him I’d pay the ¥200 it cost to ride it to video him doing it! He said he’d pay half and I could pay the other. After seeing his bravery I had to try it to! Why? Well I’m in Japan! I don’t know any of these people watching me and could care less what they think, plus who else could say they road their first electric bull in the middle of Tokyo outside in front of staring Japanese people? Nayalan would stay on for 24 seconds before getting tossed off. It really didn’t seem to be going so fast until I was the one in the helmet with one hand up. It was pretty shaky and getting clipped kind of hurt especially after being sore from Fuji! I stayed on for 27 seconds. And yes I have the video! 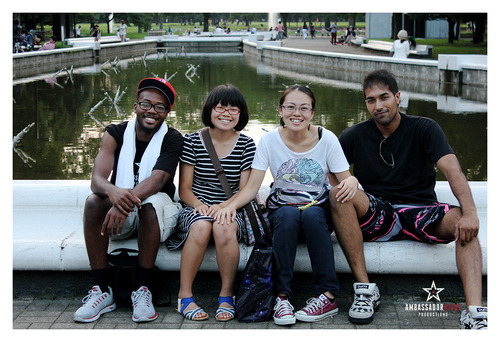 As the sunset we (Natsu, Sayo, Tomo, Yuki, and Nayalan) headed to Yoyogi Park which has historical relevance to being one of the first parks where bboys would practice in the 80s after wild style came out. 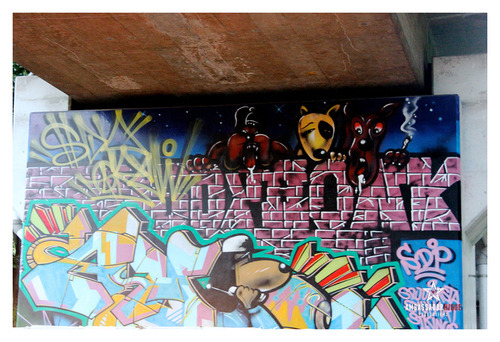 We got off the train at Hyrajuku and walked a ways to the park and just sat and people watched and took pictures before searching for the snoop dog tribute Mural. on our way we would stumble upon a festival in the park. We drank beer, got snow cones and watched Hawaiian performers, and just enjoyed each others company for a few hours. 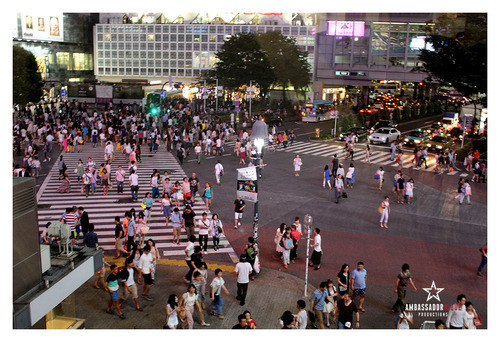 After this we would head to shinjiku where the hachiko dog statute and the busiest cross walk in the world is. The sidewalk wasn’t so busy to say it was Saturday night but we would walk through twice and take pictures from one of the busiest Starbucks in the world. 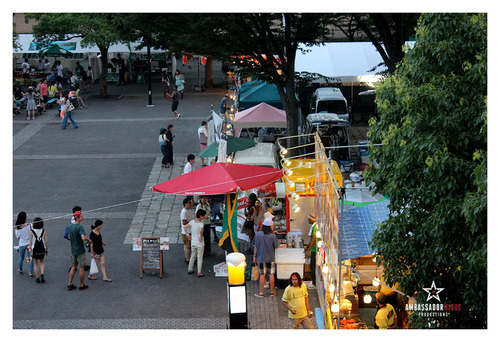 We would walk Yuki to her train station before going to really cool spot in the basement of some building in Tokyo. The restaurant was in the basement of a building and was almost a mini food court with about 5 restaurants. 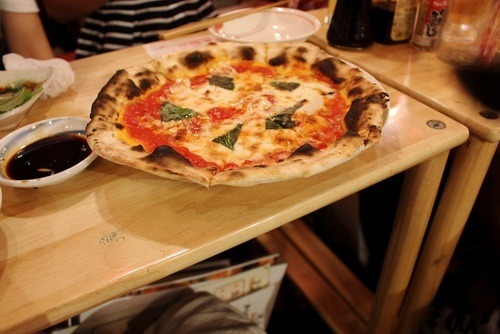 We would sit down and be given 5 menu’s from all of the restaurants and we were able to order from anywhere we wanted. 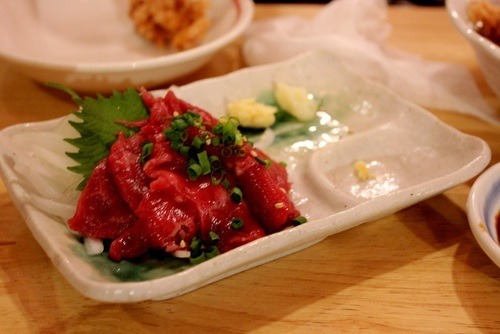 They convinced me to try raw horse meat and swore to me it was good. I watched them all prove it before I would try. After making it back to my hotel I would share my day with my Brodie’s reach out to my dads old Air Force buddy about meeting in the morning shower and sleep. This entry was posted in Blog, Road To Fuji, Road To Fuji, Written By AmbassadorNique and tagged ambassador, AmbassadorNique, bull, conversations, convo, dinner, domonique, friends, fuji, fun, good, horse, Japan, japanese, meat, meeks, Nique, osaka, Productions, riding, road, Roadtofuji, times, to, tokyo, tumblr, turn, twitter, up, vibes. Bookmark the permalink.